Ready to add another room of tunes to your On-Q lyriQ whole-house music system? This in-wall amplified keypad provides 20 watts of power per channel — perfect for background music through a pair of in-ceiling speakers. Its backlit buttons give you easy system control. It even has a built-in IR (infrared) sensor so you can use a compatible remote control from across the room. Note: a standard single-gang junction box and CAT-6 cable are required for installation. EZ-RJ45 connections are recommended for termination. 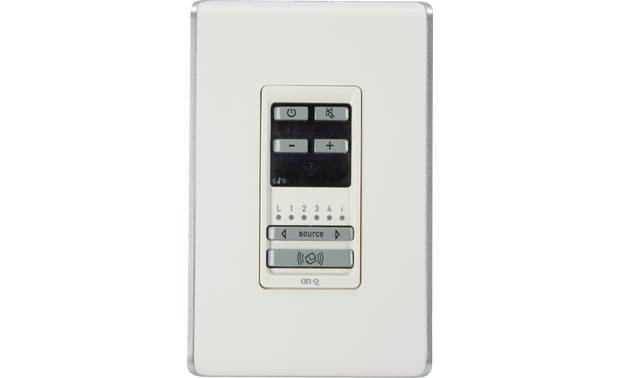 Overview: The lyriQ Studio AU5010 High Performance Keypad is an integral part of the On-Q multi-room system. When combined with other essential components such as a Source Input Unit, Distribution Module, speakers, and your source equipment (receiver, cd player, etc. ), you can create a versatile whole-house audio system that will fill your rooms with high quality sound. It uses Cat 5 wire to distribute audio signals, control information, and IR for remote control. The keypad includes two onboard 20 watt per channel class D amplifiers that can provide full, clean sound, even in larger rooms. The AU5010 is designed for indoor use only. Power/Standby: Used to power the connected speakers On and Off, this button is backlit with red LEDs that light when the unit is in Standby. Mute: This button will mute the sound when pressed in and is backlit red when Mute is on. Volume +/-: These two buttons raise/lower the volume and include 6 blue LEDs above the buttons as a visual reference for the volume level. IR Sensor: Below the Volume buttons is an infra red sensor window for receiving IR signals from a compatible remote, such as the AU1060. Source: Toggles through each of the available sources. Source LEDs: Six blue LEDs (1 - 4, L, and i) represent the selected Source. Whole House Button: When this is activated, all functions performed on the local keypad such as Volume, Mute, Source selection, etc. 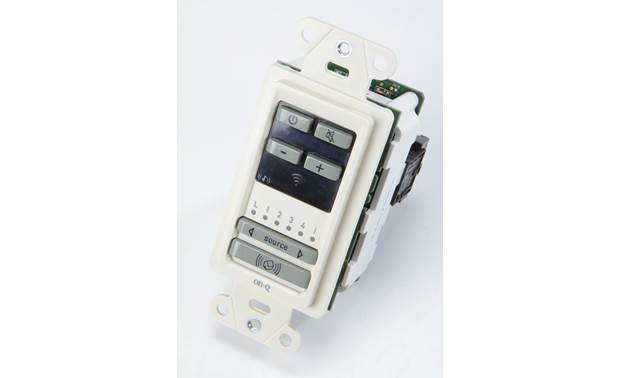 are simultaneously activated on all active keypads in the system. 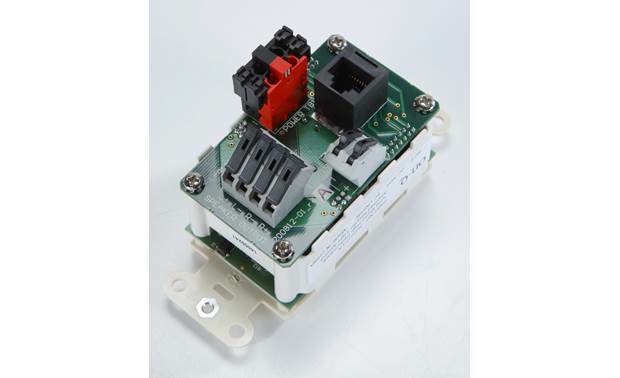 Power (TB1): Includes 4 spring-loaded terminals, 2 for Power and 2 for Ground, that get run from a Power Distribution Module (sold separately). Recommended wire is 16/4 with two lines for power and two lines for ground (Power Distribution Module output jacks are 4-terminal as well). 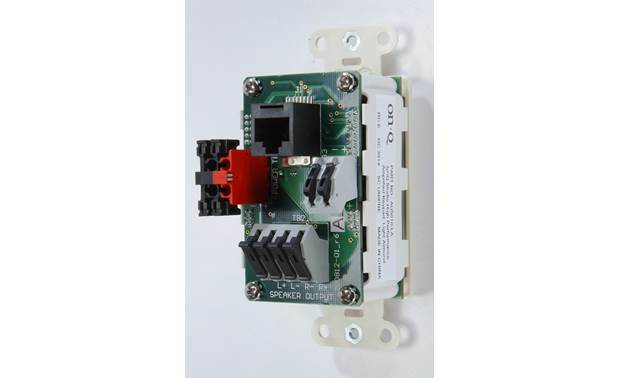 Ethernet (J1): A standard RJ45 jack is used for running both 2-channel audio and control signals in from a Zone Distribution Module (sold separately). Speaker Out (TB2): This wiring block includes 4 spring loaded terminals for Left and Right speaker outputs. Terminals are designed to accommodate up to 14 ga. speaker wire. Line Out (TB3): Two spring-loaded terminals are provided to run to a powered subwoofer. The signal outputted from here is a summed mono signal that's been low-passed at 80 Hz and is non-amplified. Terminals can accommodate wire up to 14 ga.
Searches related to the On-Q lyriQ™ Studio Design High Performance Keypad Amplified in-wall controller for lyriQ multi-room audio systems.